This is a list of notable earthquakes that had epicentres in Spain, or significantly affected the country. 1 November 1755 8.5 VIII The 1755 Lisbon earthquake caused deaths and widespread damage in southwestern Spain. Heavy damage and landslides around the epicenter. Canary Islands Its epicenter is located 15 kilometers from the coast of Güímar and had a volcanic origin. ^ a b Moreno M.E. "Los estudios de sismicidad histórica en Andalucía: Los terremotos históricos de la Provincia de Almería" (PDF) (in Spanish). Retrieved 2018-03-12. ^ a b c d e f g h i j k l m n o p q r s t u v w x y z Instituto Geográfico Nacional. "Terremotos más importantes (En España)" (in Spanish). Retrieved 2018-03-12. ^ Ministerio de Fomento. "Catálogo sísmico de la Península Ibérica (880 a. C.-1900)" (PDF) (in Spanish). Retrieved 2018-03-12. The 1861 Mendoza earthquake occurred in the province of Mendoza, Argentina on 20 March at 11:30 PM. It had a magnitude of 7.2 on the Ms scale and an intensity of IX in the Mercalli scale. Its hypocenter was located at an estimated depth of 30 kilometres (19 mi). Chile ayuda a Chile was a charity telethon being held from March 5 to March 6, 2010. The event was broadcast from Teatro Teletón in Santiago, Chile. The 1985 Rapel Lake earthquake occurred on 8 April at 21:56:59 local time with a moment magnitude of 7.5 and a maximum perceived intensity of VII. The shock was centered 75 kilometres (47 mi) southwest of Santiago, Chile, with a focal depth of 37.8 km (23 mi). 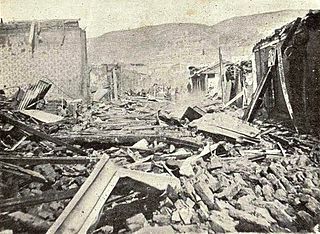 The 1906 Valparaíso earthquake hit Valparaíso, Chile, on August 16 at 19:55 local time. Its epicenter was offshore from the Valparaíso Region, and its intensity was estimated at magnitude 8.2 Mw. This is a list of earthquakes in Colombia. Colombia is a seismically active country and has a large seismic risk in many areas of its territory due to its location at the boundaries of the Malpelo, Panama, Caribbean, North Andes and South American Plates along the Pacific Ring of Fire. The 2011 Lorca earthquake was a moderate 5.1 Mw earthquake that occurred 6:47 p.m. CEST on 11 May 2011, near the town of Lorca, causing significant localized damage in the Region of Murcia, Spain, and panic among locals, and displacing many from their homes. The quake was preceded by a magnitude 4.4 (Mw) foreshock at 17:05, that inflicted substantial damage to many older structures in the area, including the historical Espolón Tower of Lorca Castle, the Hermitage of San Clemente and the Convent of Virgen de Las Huertas. Three people were killed by a falling cornice. A total of nine deaths have been confirmed, while dozens are reported injured. The earthquake was the worst to hit the region since a 5.0 Mw tremor struck west of Albolote, Granada in 1956. The 2010 Pichilemu earthquake, also known as the Libertador O'Higgins earthquake, was a 6.9 MW intraplate earthquake that struck Chile's O'Higgins Region on 11 March 2010. The earthquake was centred 15 kilometres (9.3 mi) northwest of the city of Pichilemu. The 2003 Puerto Armuelles earthquake occurred on December 25 at 02:11 local time. The epicenter was located in Panama, at about 7 km east of Puerto Armuelles, near the Panama-Costa Rica border. The earthquake had a magnitude of Mw 6.5. Two people were reported dead in Puerto Armuelles. There was building damage in Panama and Costa Rica. Power outage lasted for about four hours in Puerto Armuelles. The maximal intensity was MM VIII in Finca Naranjo, Costa Rica. The intensity was MM VII in Armuelles, Panama, and MM IV in Limón and the Central Valley, Costa Rica, including San José. This earthquake could also be felt in Panama City. The 2012 Costa Rica earthquake occurred at 08:42 local time on September 5. The epicenter of the 7.6 Mw earthquake was in the Nicoya Peninsula, 11 kilometers east-southeast of Nicoya. A tsunami warning was issued shortly afterwards, but later cancelled. Two people are known to have died, one from a heart attack and another, a construction worker, crushed by a collapsing wall. It was the second strongest earthquake recorded in Costa Rica's history, following the 1991 Limon earthquake. The 2012 Guatemala earthquake occurred on November 7 at 10:35:45 local time. The shock had a moment magnitude of 7.4 and a maximum Mercalli Intensity of VII. The epicenter was located in the Pacific Ocean, 35 kilometres (22 mi) south of Champerico in the department of Retalhuleu. The region is one of many earthquakes, where the Cocos Plate is being subducted along the Middle America Trench beneath the North American and the Caribbean Plates, near their triple junction. Rinconada is a department in the province of Jujuy in the Argentina. According to INDEC its population in 2010 was 2,489 inhabitants. Its main town is Rinconada. The town of Mina Pirquitas represents the highest point in Argentina, standing at 4,271 m above sea level. The 2017 Puebla earthquake struck at 13:14 CDT on 19 September 2017 with an estimated magnitude of Mw 7.1 and strong shaking for about 20 seconds. Its epicenter was about 55 km (34 mi) south of the city of Puebla. The earthquake caused damage in the Mexican states of Puebla and Morelos and in the Greater Mexico City area, including the collapse of more than 40 buildings. 370 people were killed by the earthquake and related building collapses, including 228 in Mexico City, and more than 6,000 were injured. Pairique Chico is a village in Jujuy Province, Argentina, in the Susques Department. Roi Méndez Martínez is a Spanish singer and guitarist.